Styled with sariah top . Styled with bonaventure blouse and sariah top . The fabric is beautiful- it stays pleated when you sit down and then get up again. It flows very elegantly while dancing. Very eye catching! Such a great skirt, very versatile. Well made too! I ordered this skirt in the Mellow Yellow color and it appears in person as pictured... cream color with a slight yellow tint. Love the flow of the skirt. I wouldn't say the skirt runs large but the elastic waist provides the opportunity to size down if needed. With my athletic frame my hip to waist ratio isn't proportional, where I usually wear a 10-12 (L) in pants but a medium in tops. I tried on the medium and large in store and went with the medium. Great skirts, own a couple and cant wait to get lots of use out of them this spring. Very on trend and classy, nice comfortable waist line and lined which is great! Love, love, love the Terre Skirt! Love the pull on elasticized waisted band, so comfortable. The pleating is lovely and keeps its form.Wonderful elegant length.Works easily dressed Up or Down depending on your accessories. Nice and elegant but I don’t think this skirt is worth $150. I LOVE that it can be worn with many different types of tops and footwear for different occasions and it can also be worn ANYWHERE. The material is so light that it seems to float. I have 2 colors and plan to buy more. This skirt is beautiful, flattering, feminine fit, however I had to return due to the length. I’m 5”2 and it was just too long, and can’t justify hemming costs for the price. I’m 115lbs and ordered a size xs for reference. Fabric/colour were gorgeous as well. Got many compliments on it. I really like it but I wish I just got a different colour. I got white and it is a bit sheer. This skirt is awesome! I loved the color green I got and how you can dress it up or down, I wish they would do this is petite since I am short and would love to have it not so long on me, reason why I am giving 4 starts instead, other than that this is beautiful. 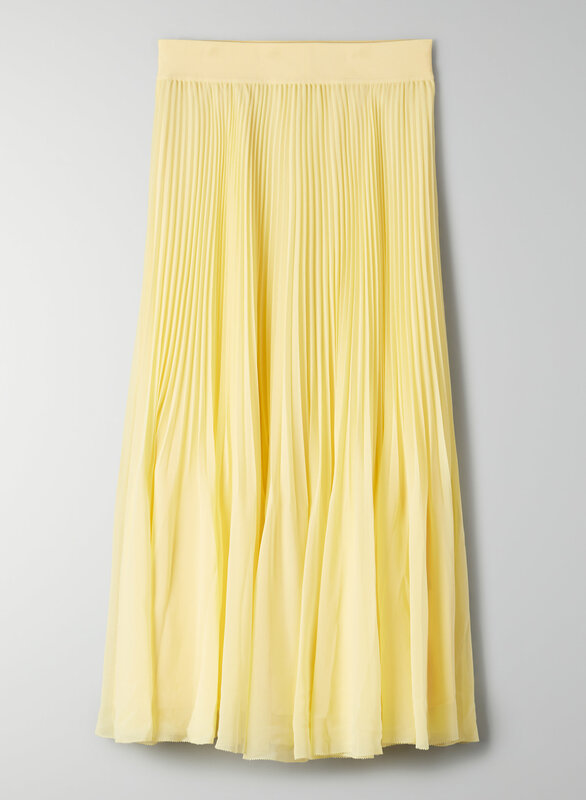 It is the perfect style and length and not too accordion pleat like which makes the skirt look too structured. One of the must haves. Great style and there are so many choices of colors! Easy to go with almost everything for all seasons! This is such a pretty skirt! I love that I can dress it up but also wear with a sweater for a more casual look. Nice fabric/good quality. Fits perfectly. True to size. I received so many compliments, even from strangers..The skirt is so versatile, you can dress it up or go casual. I have two of these skirts, one in cider gold and one with the denude overlay. They are both very beautiful, and get a lot of attention when worn out in public. The wide waistband makes it very comfortable. I'm only 5'3" so it's just a teeny bit long on me, but wearing heels helps a lot. Can't say anything bad about this skirt. This Skirt is Absolutely Stunning! It was everything I imagined and more, I'm in love!